Our vision is to develop further in the field of logistics by reaching constant growth and profit through innovative approach and use of modern communicative methods. Our mission is to reflect interest and demand of our clients, to respond to their interests, as well as the interests of the owners, employees and social environment. In 2010 we successfully performed all internal as well as external quality controls. 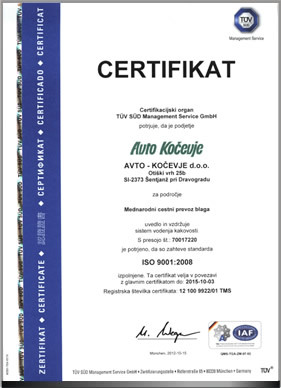 External quality control was carried out on standard ISO 9001:2008. We do not consider quality as the only factor of competition, since it goes without saying. Everyone should find a segment to makes them differet from the competition, this segment usually being the price. Thus we believe that important segments of further development and competition lay in continuous improvement, quality and constant adjustment with a lower price.